Many of us are fans of Spelunky, and there are some who are not. Many of us don’t mind paying for Spelunky, but there are those who do. Spelunky was recently released on XBLA for 1200 MS Points to look pretty in HD. 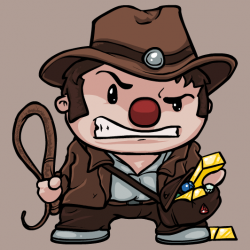 Deep in the trenches of the Internet, Darius Kazemi of Tiny Subversions, pulled a white rabbit out of his hat with an HTML5 version of Spelunky free in your web browser. This man has spelunked where no man has spelunked before. What’s great about Spelunky is it taps into our instincts to go into the unknown…and collect a lot of really cool artifacts and money. Actually, when I start thinking about it. I only played it for the money. I’m a professional spelunker. According to the Kazemi’s blog, the project isn’t over as it doesn’t have any sound yet. That won’t stop any of us from spending hours spelunking around when we can’t get our hands on a 360 controller. Will it? We can use our imagination. I’m not a fan of this game. I hate this game. IT MAKES ME SO ANGRY.